This review contains spoilers for Anna Dressed In Blood. Sometimes you read a book and you just fall head over heels in love with it. Then you discover that there will be a sequel to this awesome book and completely fangirl all over it. You wait and wait for months on end, counting down the days until you get your hands on this book, agonizing over the wait. Then the day comes where you FINALLY get the book and you drop everything else you are doing, because you just HAVE to read this book. Then you read the book and you love it and devour it, but it just does not live up to the original book. Well that is the case for me with Girl of Nightmares. I truly enjoyed every single word, but it was simply not Anna Dressed In Blood. Cas was once again a great character. Reading from his perspective is simply enjoyable. He has a great voice and thinks some incredibly funny things. He is still determined and strong, but this time his determination is geared towards finding and saving Anna. He is willing to stop at nothing to save her from Hell, not only because he owes her but because he loves her. This time around though, Cas has the help of Thomas and Carmel and this time he does not fight their help. Anna was probably my favorite part of the first book, so the severe lack of her character in this book was disconcerting to say the least. I seriously missed her character and I missed her ability to terrify me. After the end of the first book, I knew she was going to be in this book less, but I guess I was hoping she would pop up more than she did. I’ll say it again, I missed her in this book and the lack of her made it much less creepy. While Girl of Nightmares was scary, it was not terrifying and it did not keep me up frightened late at night like Anna Dressed In Blood did. A lot of this book is spent searching for a way to find and save Anna and while that was interesting and kept me guessing, it was not particularly scary. Don’t get me wrong, this book definitely had its scary and creepy moments, but it was not prominent throughout the book. I would say the book was more mystery and less thriller. The ending to Girl of Nightmares (and the series) was bittersweet to say the least. The ending makes sense and is satisfying, but it is not what I expected nor is it what I was hoping for. I was left with my mouth hanging open and tears streaming down my face. While I think some points could have been expanded on, all of the important plot points are wrapped up. 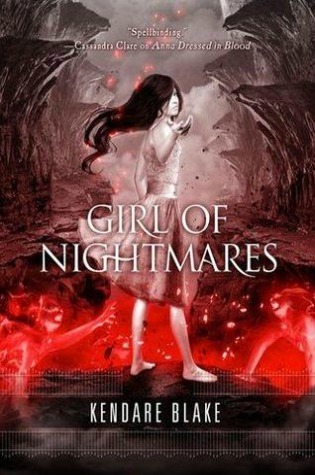 Although it was no Anna Dressed In Blood, Girl of Nightmares was still a great read. I really did enjoy every single page and every single word. I laughed and cried (a lot) and loved taking the journey with Cas and his friends. The plot had me on the edge of my seat, trying to figure out what was going to happen next. The book surprised me at numerous points and had me second guessing certain characters. I never knew what to expect all the way up until the very end of the book. As you guys probably know, I love books that keep me guessing. Overall, Girl of Nightmares is a great read and a great sequel. While it may not have lived up to the first, it is still very enjoyable and something I would gladly pick up again. Right?! I just think Anna was a lot to live up to because it is seriously one of my favorites ever! I reallllly want to read this. Great review! I cannot wait to read these books! They look so creepy and interesting! It is more than a tear jerker! Once I started crying I could not stop! For days after, any time I thought about the book I started crying lol I was crazy! Thanks for your honest thoughts - I liked Anna Dressed in Blood, so I'm looking forward to seeing what this one is like. It's a shame it wasn't as good as the first, but it's good it wasn't a complete let down. Wonderful review!